Following through on our logo design for the National Center for Organizational Continuity (NCOC), BlackOut fulfilled another element of NCOC’s overall brand strategy by producing an educational and highly interactive website. The website provides information on the NCOC and its goal of furthering the organizational continuity profession. Site visitors are funneled through specific channels to help them find the most appropriate and most useful resources to meet their needs. BlackOut integrated into the site a unique collaborative environment that facilitates communication and collaboration between local colleges and universities, continuity professionals and students or adult learners interested in continuity careers and training. 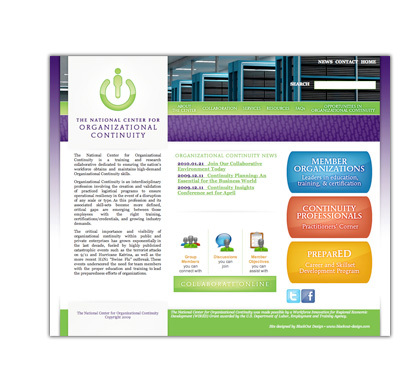 See the results at The National Center for Organizational Continuity.